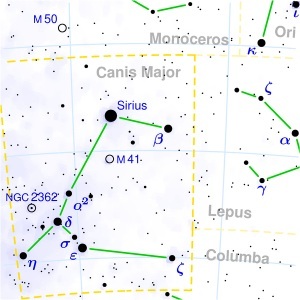 Canis Major is found southeast of Orion. An easy way to locate the constellation is to locate the three stars that make up Orion's Belt and follow the stars down in a southwesterly direction until you come to the next bright star. This is Sirius in Canis Major, it's the brightest star in the constellation and the brightest star in the night sky. Sirius also has a companion star, known as Sirius B. Sirius B was the first 'white dwarf' to be discovered. South of Sirius, the open cluster M41 can be found. Like all open clusters, it contains a few hundred young stars and has no particular shape. Together the stars are just bright enough to be seen with the naked eye on a clear night with no moon. With binoculars they appear as a faint smudge, and in a telescope the cluster is easily seen, covering about as much sky as the full moon does. The cluster appears low in the sky from northern latitudes and light pollution reduces the splendor of this cluster, but it's still worth a look. Sirius -1.4 & 8.5 / variable Binary system with an orbital period of 50 years. In the mid 1990's the apparent separation was at its minimum, so a powerful telescope is required to split the pair.